My earliest memory of competing publicly is at an Open Sports meeting in Recess in 1956 at the age of twenty. On the day in question, I had a tremendous tussle with local lad Paddy O’Malley in the hundred yards. We were neck and neck all the way through and I nicked it right on the tape. I was delighted to have silenced the vocal home support, and was subsequently quite relaxed and completely devoid of ambition or expectation going into the two hundred and twenty yards afterwards, because I had never run that particular distance before in my life. I had no realisation or appreciation that the race in question was a sprint from start to finish, so I took it relatively easy over the first fifty yards. It was a naive decision that left me trailing the rest of the field by a good twenty yards and it was only at that point that it finally dawned on me that this race, like the one hundred yards, was also a flat out sprint. Then I heard a shout from the sideline, “Ah, Ruddy is beaten now, anyway,” and I think this exclamation more than anything else, spurred me on to make amends for my unfortunate choice of tactics earlier on. I put the boot down and slowly but surely, I dragged myself back into contention. A few seconds later, the comeback was complete after I beat Paddy, literally on the line. 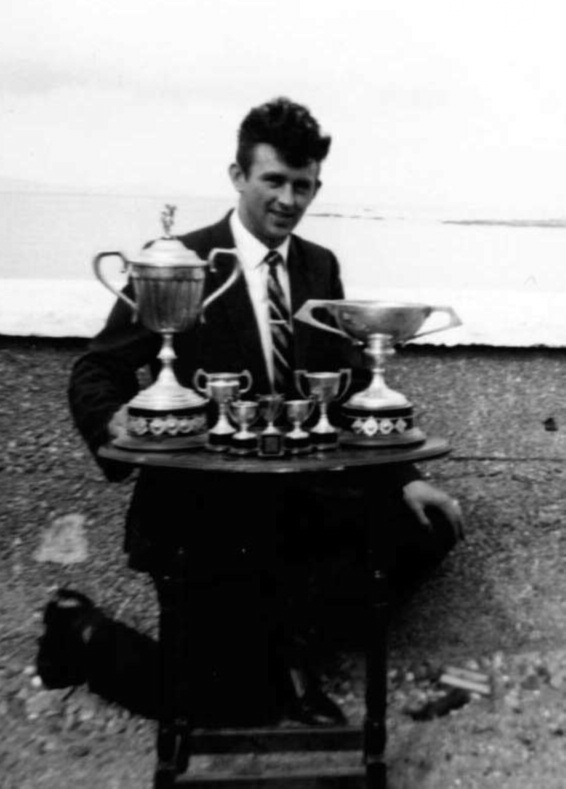 I have a fond recollection of running at the Omey races the following year. My participation in the above happened more by accident than by design. On the day in question, I happened to be in the area reading meters for the ESB, having borrowed a motorbike from Robert Glynn for the day. Once I’d finished my rounds, I decided to head down to the beach to soak up the atmosphere for a while. It was a glorious summer’s day and there was a huge crowd present. As I went to pay in at the gate, I was shocked to discover that I hadn’t a penny, having inadvertently left the few bob I had in my other trouser pocket at home. I was acutely embarrassed, but the committee members on duty allowed me through nonetheless and as luck would have it, I couldn’t have timed my arrival any better, because the one hundred yards was just about to begin. I had the shoes and socks off in a matter of seconds, rolled up the trousers and took my place on the starting line. I had hardly time to draw a breath, before the gun went and I was pounding the hard sand at a fast and furious pace. Despite being a bit sluggish on the start, I recovered sufficiently to edge out David Griffin over the final few yards. We renewed our rivalry a few minutes later in the two hundred and twenty, and this time I lead from start to finish, after flying out of the “blocks” on the starting gun. I won the princely sum of thirty shillings for winning the two races (fifteen shillings per race) and proceeded to have a great day out on the proceeds of my athletic endeavours.